So since the subforum is locked at the moment, I figured I'd post here to chatter with anyone about the upcoming RPG. What species everyone going to want to use? I'm leaning on Pteranodon. There's so many good choices, I'll have to see what people are picking before making my list. The only certainty is that I'll have a Brontosaurus character. Guaranteed a Megaraptor character, though I'll bet most will make a Velociraptor. Raptors will be capped off at some point. I think 20 or 25 in that area will do. I think 20 or so slots is a bit much. Kinda defeats purpose of slots. Is it alright if I drop Sue's profile right here? I'll be sure to provide a writing sample upon request. 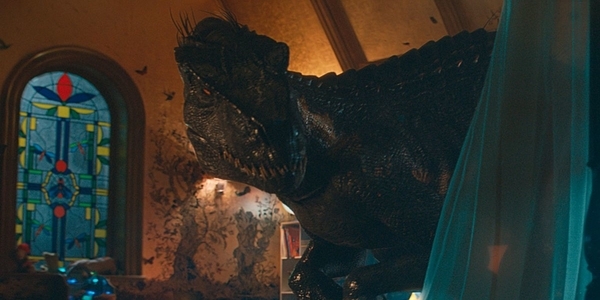 Bio: One of the oldest Tyrannosaurus in Masrani's stock, Sue has waited patiently for her chance to roam free. Despite being in the prime of her life, Sue's ferocity has given her a few healed bones including 3 healed ribs, and a small kink near the near of her tail where the vertebrae have fused after being stepped on when she was a juvenile. Territory: Wherever she wants on Isla Nublar. Often stays clear of her old pen, due to fear of being trapped again. I want a raptor most definitely. Though I may try something new. 20 slots are probably a bit much for raptors, yeah. I'd go with 10 first and then maybe increase it if there's enough activity in the RP. Carnotaurus or Spinosaurus, maybe? I still need to learn more, since I never done RPG. I think we should wait until the RP grows to a very large number of players before doing any actual capping. There aren't many predators on the island capable of taking on the many species of giant, well-armed herbivores we have in our Field Guide, and the Tyrannosaurs are already limited to a maximum of five individuals (IMO one Tyrannosaur equals roughly five raptors, possibly more). Plus there is the ecologically similar, but more up-to-date Megaraptor as an alternate choice. Sorry bud, but neither are going to be included. You know we switched from post-JP3 Sorna to a post-JW Nublar, right? Hmmm guess maybe I'll try for a t. rex, if I do this. Won't be able to be active a lot every day and I am sure many others would like a raptor so I'll probably avoid that. Suchomimus is probably what I'm going for. I once had a relatively docile Baryonyx and I think a larger, more aggressive cousin might be fun. A raptor or Troon on might be in order though. I might wait and see what's being played first though as I like to play less popular species. Well, since my hopes for a Carnotaur have been dashed, ( ) I guess I'll try for a Metriacanthosaurus. Something in that category. Small-to-medium sized carnivore. I've been thinking a bit Metria as well too. I used to have two of them. I want to see the profile first. As of the time of this post, all but one Field Guide Entry has been posted. Everyone who plans on playing should check them out and see if you still want to go with what you have been thinking of thus far, or if there is something else that sparks your interest. If you only do what you can do, you will never be better than what you are.